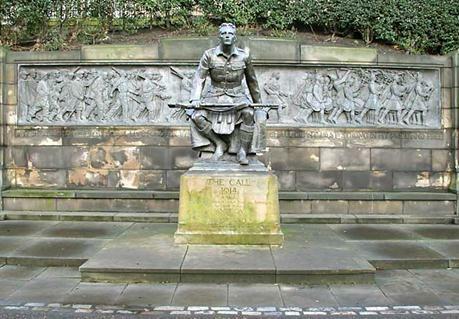 The Scots American War Memorial or Scottish American War Memorial in Princes Street Gardens in Edinburgh, called "The Call 1914", was erected in 1927 and shows a kilted infantryman looking towards Castle Rock. The bronze backdrop frieze shows Scots of differing professions answering the call and changing from civilians into marching soldiers following a pipe band. The memorial was given by Scottish-Americans to honor Scots who had served in the First World War. 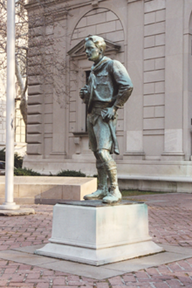 "The Call 1914" was designed by R. Tait McKenzie (above), a Canadian-born sculptor, doctor, soldier, physical educator, athlete and Scouter working at the time at the University of Pennsylvania in Philadelphia. McKenzie only took to sculpture in later life having started his interests in physical education. “The Call” took him four years to complete. The memorial was said to have cost ten thousand pounds at the time it was built. McKenzie’s most famous sculpture is The Ideal Scout, also known as The Boy Scout. This has been reproduced and sits in front of many U.S. Boy Scout offices across the nation, as well as at the Philadelphia headquarters of the Boy Scouts of America, and Gilwell Park, Australia. Others include, Benjamin Franklin in 1723 (1910–14), University of Pennsylvania; The Homecoming (1922), Cambridge, England; The Victor (1925), Woodbury, New Jersey; Edgar Fahs Smith (1925–26), University of Pennsylvania; General James Wolfe (1927), London, England, and; Jane Delano Monument (1933), Washington, D.C.
Near the end of his life, McKenzie expressed a wish that following his death his heart be buried in front of the Scottish-American War Memorial that he had created in Edinburgh, Scotland. When he died in Philadelphia, Pennsylvania, this request was denied by the "corporation of that city", but his heart was subsequently buried at the nearby St. Cuthbert churchyard. At the very top of “The Call 1914” are the two intertwined escutcheons of America and Scotland. At the bottom of the frieze are lines from E. A. Mackintosh's poem "A Creed": "If it be life that waits I shall live forever unconquered; if death I shall die at last strong in my pride and free." 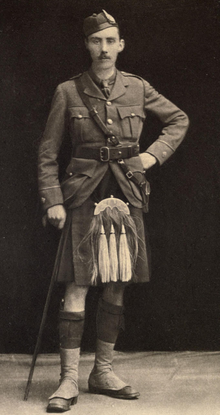 Lieutenant Ewart Alan Mackintosh MC (4 March 1893 – 23 November 1917) was a war poet and an officer in the Seaforth Highlanders from December 1914. Mackintosh was killed whilst observing the second day of the second Battle of Cambrai, 21 November 1917. 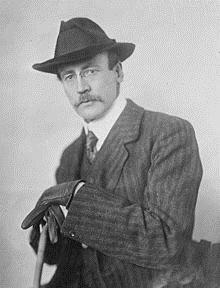 Ewart Alan Mackintosh was born on 4 March 1893, the only son of Alexander Mackintosh and his wife. Although he was born in Brighton in Sussex, his father's roots were from Alness in Ross and Cromarty. His maternal grandfather was the preacher James Guinness Rogers. He said that it was because of his grandfather's friendship with British Prime Minister, William Ewart Gladstone, that he was given his first name. He studied locally at Brighton College whilst also studying Gaelic and learning to play the pipes during the holidays. He continued his studies at St Paul's school in London and then studied classics at Christ Church, Oxford. Mackintosh, who was a member of the University of Oxford Officers' Training Corps, tried to join the army immediately war broke out in August and while still in his university course. He was rejected on the grounds of his poor eyesight. He reapplied and was accepted by the Seaforth Highlanders, and was commissioned as a second lieutenant on 31 December 1914. He served with the 5th (The Sutherland and Caithness Highland) Battalion, Seaforth Highlanders (a Territorial Force unit), which was part of 51st (Highland) Division. 2nd Lt. (temp. Lt.) Ewart Alan Mackintosh, l/5th Bn., Sea. Highrs., T.F. For conspicuous gallantry. He organized and led a successful raid on the enemy's trenches with great skill and courage. Several of the enemy were disposed of and a strong point destroyed. He also brought back two wounded men under heavy fire. Mackintosh had been trying to bring Sutherland, who had lost a number of limbs, back to the trenches. Sutherland died of his wounds and had to be left; he has no known burial place. At the age of 23, Mackintosh regarded himself as a father to his men, and they affectionately called him "Tosh". Sutherland was a Scot, but many of Mackintosh's other charges were from New Zealand. One of Mackintosh's final poems, Cha Till Maccrimmein, appears to foretell his own death. He returned to England in August 1915 after being wounded in High Wood on the Somme. He was stationed near Cambridge for eight months during which time he was training cadets and he became engaged to Sylvia Marsh who was from a Quaker family. Mackintosh was killed in action on the second day of the Battle of Cambrai, 21 November 1917, whilst with the 4th Seaforth Highlanders. He was there observing the heavy action near the village of Cantaing. Cambrai was noteworthy in using new tactics including the first mass use of tanks. He was buried in the Orival Wood Cemetery near Flesquières in northern France. 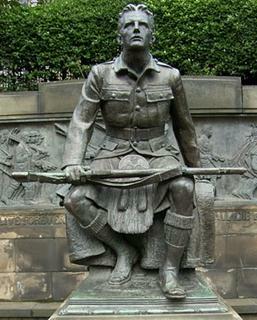 "Today we commemorate the Great War with the figure of a common soldier – one youth separated from the thronging files of recruits pressing on from behind – one youth within sound of the pipes and drums and within sight of the old Castle on the hill – one son of Scotland from a mansion or a manse or a mine, from a farm or a factory, from a Glasgow close or an Edinburgh lane – it matters not. For he came from all of these. He kept lonely company with his own soul in a tank or in a trench, on the sea or in the sky. And he went to his death alone."